Garrett Madison is a mountain climbing instructor who has incorporated Ironwears latest vest, the Speed Vest into his own training programs. Garrett is using the Speed Vest to train for a 2008 Everest climb, on his runs, in the rock climbing gym, and his training hikes. "The Speed Vest is the first vest you can actually run with, it stays in place and provides extra resistance without any interference, and you really feel it when you run hills. Training with the Speed Vest is a fast way to build endurance." Garrett is currently working with Ironwear and is developing exercise programs utilizing the Speed Vest and other Ironwear products to train climbers. "I see this vest becoming popular in rock climbing gyms for those wanting to improve their hand and upper body strength. Personally though, I think a lot of people who train for peaks like Rainier would use the Speed Vest if they knew about it." 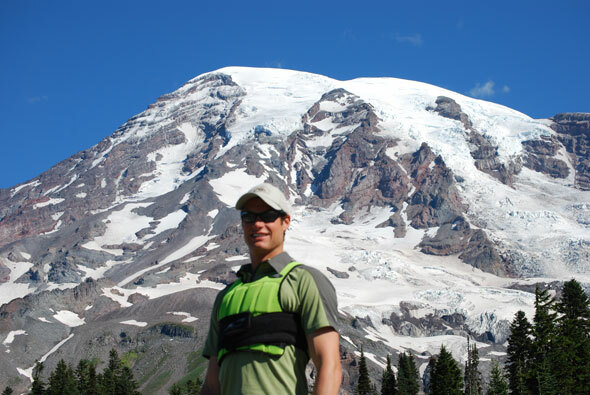 Garrett began mountaineering 15 years ago on the summit of Mount Rainier with his father. His guiding career began in 1999 with Rainier Mountaineering, Inc., and he has been commited to sharing the challenges, rewards, and beauty of the mountains ever since. He has guided over 100 groups successfully to the top of Mount Rainier, and has followed his passion to peaks all over the world, culminating with the summit of Mount Everest in 2006. He has worked with former Olympic athletes to develop a distinct fitness program that allowed him to confidently summit the highest mountain on Earth, and has translated the skills and methodology he learned to share the sport of mountaineering with climbers of all levels. The Train 2 Climb program begins in mid-January, and brings individuals to a level of physical fitness to confidently summit Mount Rainier the following summer. The program combines strength, endurance, and interval training with nutrition, stretching, and balance work to ideally prepare climbers for the best mountain climbing experience. Mountain climbing is a challenging and difficult sport. High performance athletes, weekend warriors, and novice climbers alike are often surprised by the demands of reaching a summit because of the multiple and unusual rigors one faces on a mountain. Train 2 Climb is a comprehensive fitness program that combines six months of unique conditioning both in athletic clubs and on the trail with the final goal of summiting Mt. Rainier. You and your summit team will engage in a unique training plan that is specific to the physical and mental challenges faced while mountaineering. This involves working with a personal trainer, strength and endurance training, and group training hikes. You will be confident and physically ready for the challenge. This program was developed by Everest summiteer and international mountain guide Garrett Madison, to help novice climbers prepare for a successful summit attempt of Mount Rainier. Train 2 Climb is supported by NASM certified fitness trainers.